This 3 oz. stainless steel flask offers the caution "Don't Drink and Ride." 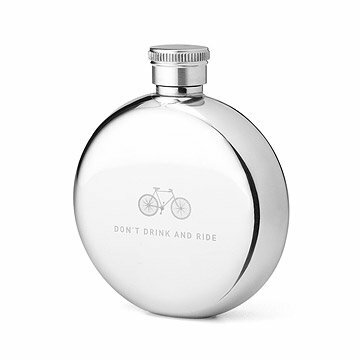 Everyone knows you should never drink and drive, but this stainless steel flask offers a wry reminder that you shouldn't drink and ride a bike either! Nonetheless, the handy 3 oz. size is perfectly portable, whether you're headed to a rooftop party or any unfortunately dry destination. The flask's shape is reminiscent of a pocket watch or bicycle bell, and the front features the caution "Don't Drink and Ride" accompanied by a bike drawing. Great for bike enthusiasts, liquor aficionados and urban survivalists. Made in China. Inspired by the old world utilitarian ideal of making something that is built to last. Neil Rasmus and Richard Brandt started their company in 2005 with the idea of bringing good design to otherwise mundane objects. Made with great care and attention to detail, this series of functional every day staples is designed to be the perfect gifts for men. Hand wash Rinse before use. Lovely, well-made, and sturdy. Small but true to size specs listed online. Great gift for your bike pub crawling friends! This was a gift for my sister. Good quality and couldn't have penned the phrase better myself! Gave it to my son-in-law and he said he liked it and it came in handy when flying because of its size.